Customers who reserved the $200 bundle through GameStop and other retailers were notified by email that they couldn't fulfill the order. An official announcement from Warner Bros. written last night shed some further light on the situation. We regret to inform you that we are not able to release the Batmobile Collector's Edition of Batman: Arkham Knight due to unforeseen circumstances that greatly compromised the quality of this extremely limited run of product. We are deeply apologetic for this unfortunate outcome. If you did pre-order the Batmobile Collector's Edition, please go to the retail location where you pre-ordered the product and you will receive a full refund of your deposit or it can be rolled over to another Batman: Arkham Knight edition or another product of your choice. 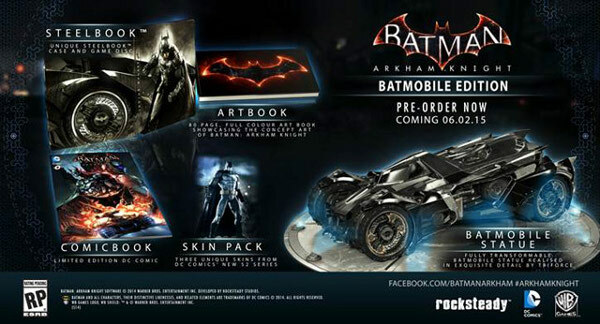 One of the other extras in the Batmobile Collector's Edition was an exclusive New 52 Skin Pack. This pack included new appearances for Batman, Robin and Nightwing. Warner Bros. will now be giving that DLC to all players for free, perhaps as a sort of apology for this whole problem. Warner Bros. didn't elaborate on exactly what went wrong with the Batmobile Edition. It sounds like it must have been catastrophic, though, to force a complete cancellation just days before Arkham Knight's debut. It's really the worst case scenario. I'd imagine that some of the would-be Batmobile owners might want to get the $100 Limited Edition with a Batman statue instead but at this point the supply's probably depleted for that bundle. Batman: Arkham Knight will debut worldwide on June 23rd for PS4, Xbox One and PC.